This is a toolkit for GM-less, solo-gaming that clocks in at 74 pages, 1 page front cover, 2 pages of editorial/introduction, 3 pages of SRD, leaving us with 68 pages of content. It should be noted that pages are laid out in 6’’ by 9’’, which means that you can fit up to 4 pages of content on a given sheet of paper when printing this – provided, your sight’s good enough, that is. All right, so, this is a GM-less solo-adventure generator, which means that the only target demographic, the reader, will be also the one who’ll experience the potential SPOILERs…and that puts me, as a reviewer, into a bit of a conundrum. If I discuss the details of the adventure itself, I will automatically SPOIL it….but at the same time, I can’t just discuss this in broad strokes. Thankfully, this is not just a solo-adventure per se – it is not a choose-your-own-adventure type of experience; instead, it basically acts as a kind of DIY-procedural-generating dungeoneering experience, where the single player and rolling the dice replace the random generation methods that would usually be taken over by, for example, a CPU. This means that the supplement is pretty much defined by a ton of random tables for monster, trap, magic effect generation, etc. – these represent an alternative use of sorts – even if you’re not interested in GM-less solo-gaming, you may well derive some use from them. Now, rules-wise, this supplement employs Labyrinth Lord as a default, which is, for once, also the system I’d strongly recommend that you use for the supplement, at least when using it as intended. Why? Even minor modifications of the simple base engine can lead to more work on behalf of the player, and you’ll be rolling a lot of dice. All right, that out of the way, the supplement assumes the backdrop of Cryptopolis – a total of one page is devoted to describing this backdrop, depicting a sprawling metropolis on the desert sands, with sunken civilizations and tombs below – this section is inspiring, but also unfortunately very brief, which taps into one point of criticism I have regarding this supplement – but we’ll return to that later. This backdrop also influences the magic items that can be found in the city and in the dungeon – magic babushs and turbans as well as artifacts tie into the per se interesting, if painfully sparse, lore. While the formatting of these items is per se precise, it does sport a few cosmetic deviations from wording standards, though none that per se influence rules integrity. In a somewhat odd decision, red notes in an unusual font are provided here and there and throughout the pdf as annotations of sorts – specifying, for example, that a magical scimitar that allows you to fight underwater sans penalty doesn’t help you actually breathe underwater. Whether you mind that this is not included in the rules language of the item per se or not, depends on your preference. Now, running solo requires some considerations: You first calculate AL (Average Level): You add up all character levels, divide by 3 and round up. Multiclass characters multiply their level by 1.5, rounding up. Final results below 1 are treated as ½. Beyond the AL, character progression is pretty simple, so creating characters of higher levels is not difficult. The ingenious and smart decision here, though, would be the routine: You establish a routine for “In the City” and “Into the Ruins” – the first routine handles city crawling, equipment purchases and selling, the second dungeon exploration. Here, we determine marching order, resting, etc. In the adventure log (sheet provided), you’ll note down e.g. detecting etc. – this is very important, for putting things down on the log prevents you from cheating and randomly determining who is hit by attacks etc. Now, the city time comes with a randomly-determined time spent covering shops etc. and finding equipment, with a massive array of tables. 20 different city events and encounters can be found, though the respective set-up for them is pretty bare bones. In the dungeon, a total of 6 mini-geomorphs to start off exploration are provided, and from there on out, we roll on the main table: We can get corridors, doors, chambers, stairs, dead end or wandering monsters – these all point to their own subtables. Doors, for example, can be 5 different types; 3 door locations can be found and we get 4 spaces beyond doors. In corridors, we have an illumination subtable, which btw. is not found for chambers per se. That being said, whether or not you roll on all of these tables depends on your own preferences; the strength of the system as presented is the fact that you can pretty seamlessly expand all these tables. Traps can affect the first line, whole group or a single target. The pdf also contains some suggestions for character goals in campaign games as well as a massive table on character backgrounds and quirks. Editing and formatting are good on a formal and rules-language level – not perfect, but really smooth, considering that this is the company’s freshman offering. Layout adheres to a 1-column b/w-standard, with usually color being only used for the annotations mentioned before. Pretty minimalist, but printer-friendly. The pdf sports a couple of artworks, but if you’re familiar with stock art, you’ll be familiar with the pieces herein. The pdf actually comes with moderately detailed bookmarks, though e.g. sub-sections like magic turbans etc. don’t get their own bookmark – in short, it’s better than no bookmarks, but not yet perfect, particularly considering the solo-gaming angle. I cannot comment on the PoD-version, since I do not own it. 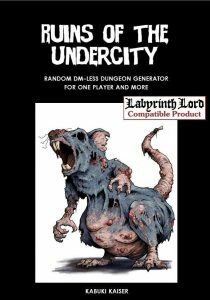 Patrice Crespin’s “Ruins of the Undercity” is at once a resounding success and a failure. It is a resounding success in providing the means to generate a solo, GM-less playing-experience with the Labyrinth Lord rules and achieves its goals in that paradigm with a resounding success. It can also be employed to “learn” the procedures of adventuring on your own; while many supplements explain rules, there is an implicit methodology that veterans often forget, so yeah, there is definitely value here. At the same time, if rated based on the merits as an adventure, I’d consider this to be a failure. Any good GM knows that the details and unique components are what makes an adventure stand out; the terrain, the stand-out rooms, the bosses…and while the module does sport a couple of intriguing items and artifacts and goals, it sacrifices the details in favor of general appeal and replayability…and is worse for it: While you can generate an infinite array of dungeon levels with this booklet, my issue is…that they become somewhat redundant, somewhat bland. The little bit of lore that is here, is actually really cool, but it’s too little to make the city or the dungeon really come to life, to engage me. Then again, I’m a sucker for stories and indirect storytelling, so if you don’t mind procedurally-generated dungeon-crawler games, then you’ll love this! If not, however, then this will be basically a huge amount of tables that won’t bring you too much joy. Rating this, then, is a tough job. As a person, this did nothing for me, apart from honest appreciation for the chassis presented. As a reviewer, though, I do have to take into account that this may well be exactly what you’re looking for. If you are less spoiled regarding what you expect from solo-adventuring, or if you don’t mind expanding tables, then this may well be what you’ve been waiting for. Ultimately, though, I can’t bring myself to see this as anything but a mixed bag – mechanically and design-wise interesting, but a bit too generic for its own good. My official final verdict will hence be 3 stars. The print version can be found here on lulu!